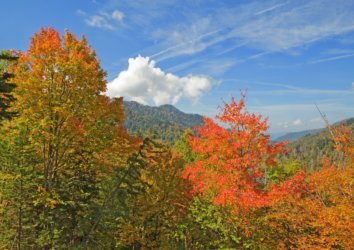 Three Amazing Smoky Mountain Scenic Drives for Fall! Why is fall so spectacular at the Great Smoky Mountains National Park? For one, there’s an enormous diversity of over 100 species of trees in the area, most of them deciduous. As summer ends, these many different trees turn a rainbow of gorgeous yellows, golds, reds, and even purples. Plus, the variety of elevations throughout the park means that the colors change over the course of the autumn months: September and early October yield changing colors in trees like yellow birch, mountain maple, and pin cherry, while later October and November see deepening colors of lower-elevation trees like super maple, sweetgum, and the hickories. 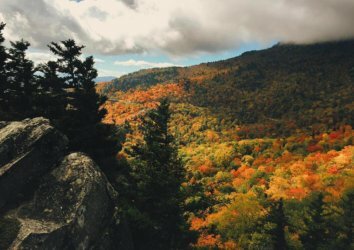 Read on to discover which scenic drives will yield the most stunning autumn views during your fall trip to the Great Smoky Mountains National Park. And be sure to check out our Fall Foliage Map for up-to-date info on where the leaves have changed across the US, when they’ll change, why they change…and even some printable coloring sheets for the kids! 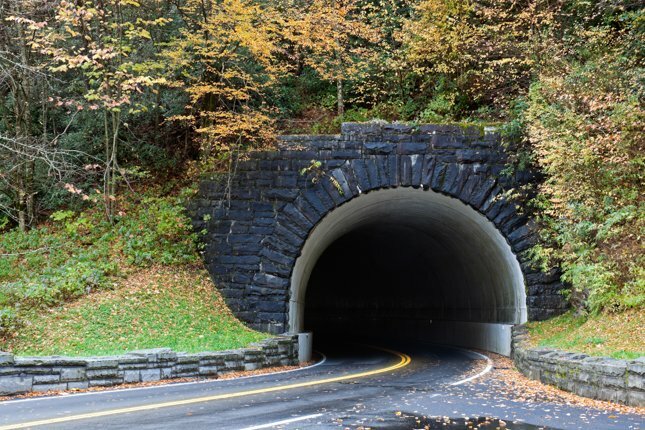 Spanning mountain views and woodlands of pine-oak, evergreen spruce, and cove hardwoods, Newfound Gap Road offers 31 gorgeous miles of scenic roadway. Traffic flows at a faster pace than it does on the Cades Cove Loop, and you’ll have the chance to stop at scenic overlooks and points of interest like Mingus Mill and Newfound Gap, the park’s lowest point (southern Appalachians refer to low-elevation spots as gaps; others call them passes or notches). Whatever you call it, gorgeous views of red-gold autumn leaves abound. For an even more unforgettable visit, consider visiting Clingmans Dome. 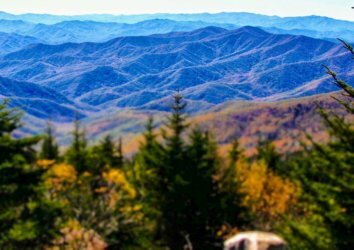 The highest point in the park (and in Tennessee) at 6,643 feet, it offers an incredible 360-degree view of the Smoky Mountains. Don’t want to brave the steep half-mile hike? There are still plenty of photo opps – snap a few from your car. Sprawling, stop-in-your-tracks gorgeous views make the Cades Cove Loop a favorite among Smoky Mountains visitors. A slow-moving, single-lane, 11-mile loop means there’s plenty of time to take in the lush rolling greens, mountain-peak backdrops, and fields of wildflowers. You’ll also spy restored buildings including log homes, churches, and a working mill. And keep an eye out for black bears: They’ve been known to make appearances here in the late summer and early fall. 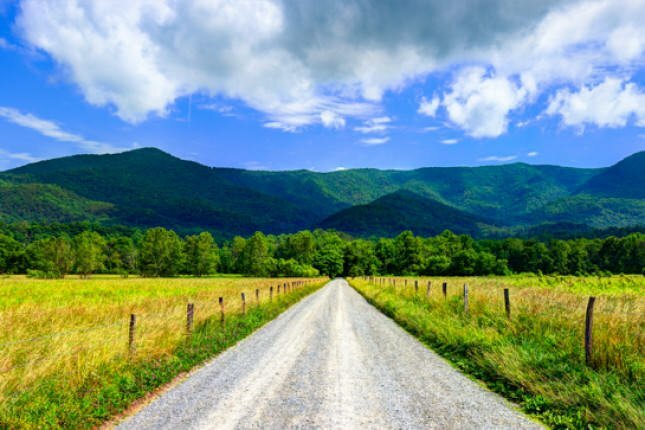 Expect to adopt a vacationer’s leisurely pace: Cades Cove Loop often takes 2-4 hours to complete (plenty of time to stop and enjoy the scenic overlooks). Winding its way for 18 miles between Gatlinburg and Townsend, the Little River Road offers a plethora of autumnal highlights, including picnic spots, overlooks, and several waterfalls. Seven signposts dot the road, each of them marking a point of interest. 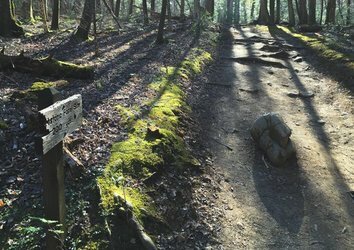 Enter the Laurel Falls trailhead for an easy 2.5-mile hike at Stop 2, or pack for a picturesque picnic at Stop 4, Metcalfe Bottoms, which offers a peaceful spot for an alfresco lunch. Park at Stop 5 and take a short hike to Meig Falls, where cascading waterfall views are especially brilliant in late fall. 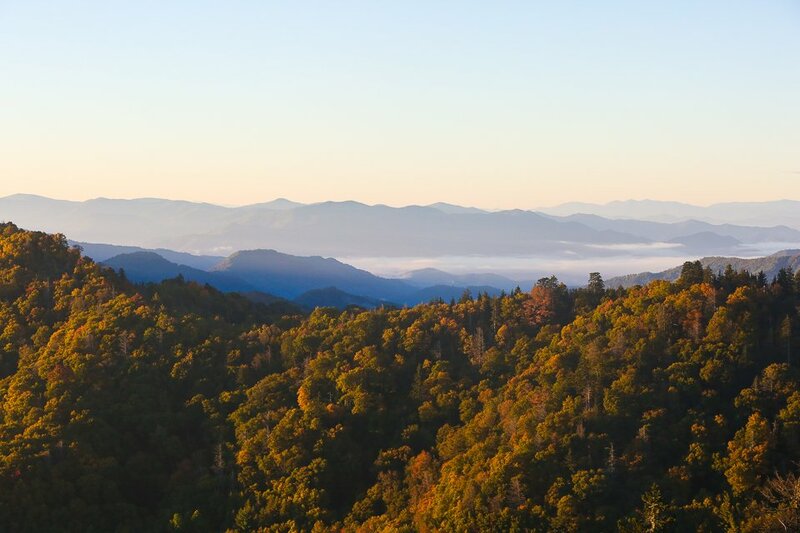 Need a place to call home during your fall trip to the Great Smoky Mountains National Park? 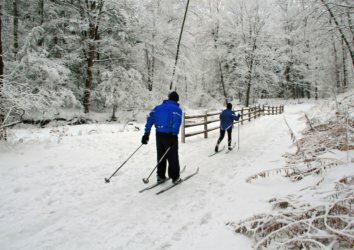 Browse our many cabin rentals.